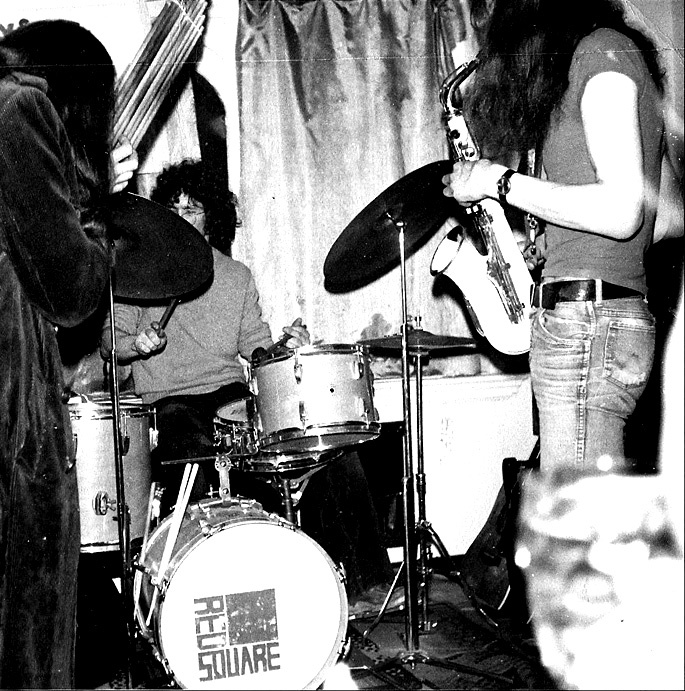 OK – let’s go for the throat……..
RED SQUARE is a pioneering free-improvising, avant-rock band formed by Ian Staples (guitar), Jon Seagroatt (soprano sax / bass clarinet) and Roger Telford (drums / percussion) in 1974. The band, originally from Southend-on-Sea, Essex, broke up in 1978, before reforming again in 2008 as a result of renewed interest in the band’s bridging of the worlds of psychedelia, metal and free-jazz. Pre-dating Sonic Youth by seven years, Last Exit by a decade and the Thing by twenty five, Red Square’s railing aural assaults were once considered too extreme for commercial release. 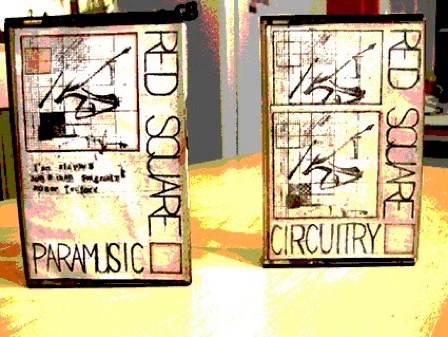 In a gesture of proto-punk defiance they self-released two now impossible-to-find cassette-only albums, ‘Paramusic’ (1975) and ‘Circuitry’ (1976) (below). Red Square revolves around the astonishingly original guitar playing of veteran sixties survivor, Ian Staples – tape and noise experimenter, action-painter, Grosvenor Square radical and wired denizen of the Middle Earth Club. Not only does Staples’ iconoclastic sound palette encompass influences from delta blues and Hendrix through to Derek Bailey and Stockhausen, but a mongrel-blues strain of Trout Mask-inspired DNA courses virulently through every line he plays. Red Square continue to deliver free-form avant-metal through very big speakers with undiminished enthusiasm. There’s an expanded Red Square biography here on Wikipedia. 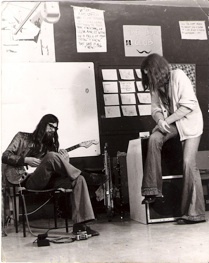 The groundwork for the band’s sound was laid when Ian Staples and Jon Seagroatt began a musical collaboration in Southend-on-Sea, Essex in 1972, following encounters at a number of experimental music workshops. Ian, fresh from the London underground scene, had been gigging regularly at the legendary Middle Earth Club in London with Ginger Johnson’s African Drummers, alongside, amongst others, Pink Floyd and Mark Bolan. He was working with tape multi-tracking, noise, psychedelia and action painting. Ian’s electric guitar playing was a revolutionary blend of Hendrix and Beefheart, with the sonic palettes of Derek Bailey and Stockhausen. He became adept at unleashing cunningly atonal guitar riffs, which referenced metal without ever becoming metal. Likewise, Jon had been galvanized by the explorations of Johns Coltrane and Tchcai, Evan Parker, Steve Lacy, Ornette Coleman and Albert Ayler, and also drew freely on groups such as Can, Faust, Weather Report, the Art Ensemble of Chicago and Soft Machine. Both were also heavily influenced by developments in contemporary ‘art’ music. From the beginning of their collaboration they determined to improvise all of their music. Within a year they found a kindred spirit in drummer Roger Telford, a committed exponent of the free-jazz style of kit playing being pioneered at the time by Milford Graves and Sunny Murray. 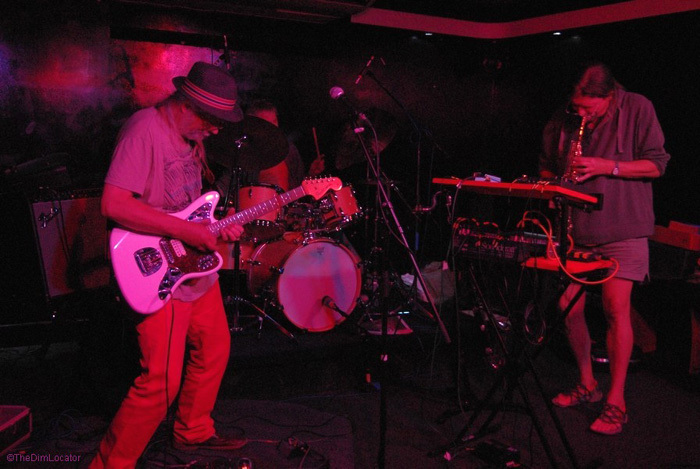 The central combination of electric guitar, amplified bass clarinet or soprano sax and drum kit gave Red Square a unique sound palette to explore, as well an instantly recognisable group sound. 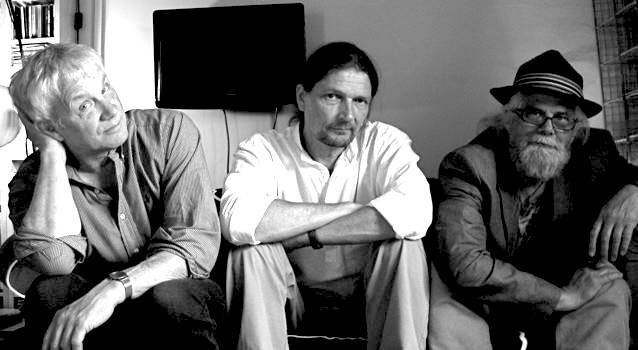 The line up of Ian, Jon and Roger remained constant throughout the band’s original six year history, as did the commitment to total improvisation, but, given the group’s wide range of influences, their improvisations drew as much on avant-rock as they did on jazz or contemporary improvised music. Live, Red Square could be punishingly loud (one urban myth recounts that a Red Square set drowned out Cliff Richard who was playing at a venue half a mile away!). They frequently enjoyed a combative relationship with audiences. Their enthusiasm for playing inappropriate venues (including folk clubs and pub-rock dives), and their willingness to engage forcefully with hecklers led to a number of hurried back-door exits from gigs, and presaged the arrival of punk a few years later. Red Square broke up in 1978. Thirty years later, in 2008, the three were approached by FMR Records about releasing our old material. They so enjoyed trawling through the reels of tape to choose album tracks that they decided to re-form, and are now back gigging, thirty years after last playing together as Red Square, and recording new choice cuts of elemental, genre-defying, avant-rock and outer-limit free-jazz rampaging. Post-reformation dates have included the Vortex, Cafe Oto, Supernormal Festival, Resonance FM, Darkstar at the Dogstar, Oxford’s Klub Kakofanney, Southend’s Culture As A Dare Fringe Festival, Utrophia’s Cwm Festival, OCM at Modern Art Oxford, the Tinderbox Festival, Oxford Improvisors, Chatham’s Brutally Honest Club and Brighton’s On The Edge.